Long before the digital cinema age, Ray Harryhausen set the gold standard for his own brand of cinematic magic with his innovative creation of a stop-motion model animation known as ‘Dynamation’. Known as one of cinema history’s greatest pioneers and innovators, he is credited with having inspired numerous filmmakers such as George Lucas, Steven Spielberg, Guillermo Del Toro, Peter Jackson and Tim Burton. Harryhausen’s style is best known for blending the world of live action and model stop-motion, which completely changed the direction of special effects in the early 1950’s-60’s. In this year’s Prop Store Live Auction, we are lucky enough to have an amazing collection of Harryhausen sketches from some of his most iconic films, like Jason And The Argonauts (1963), The Golden Voyage Of Sinbad (1973) and The Valley Of Gwangi (1969). The first hand-drawn sketch shown above from The Valley Of Gwangi is a scale comparison, showing two cowboys, one of whom is atop a horse with lasso in hand, alongside a detailed rendering of a Styracosaurus and an outline of Gwangi. 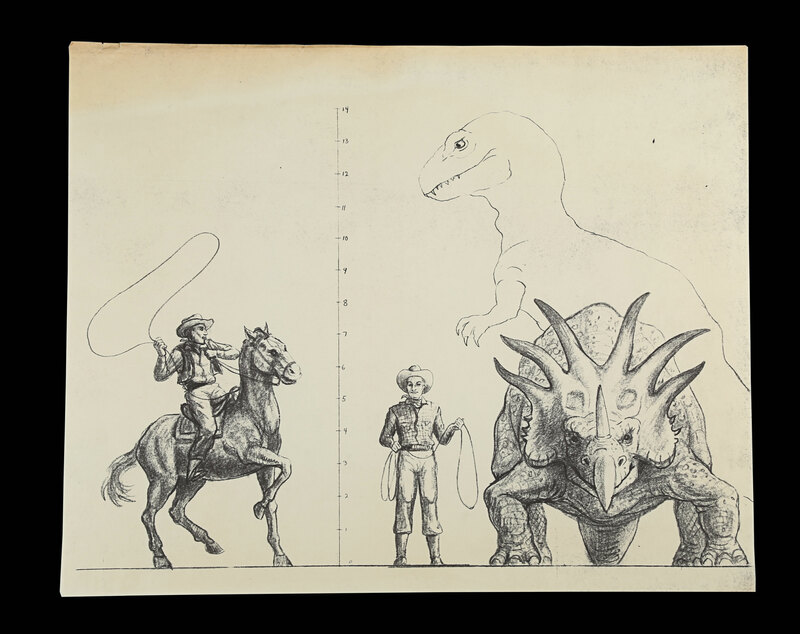 A height scale indicates a height of six feet for the standing human and 14 feet for Gwangi. 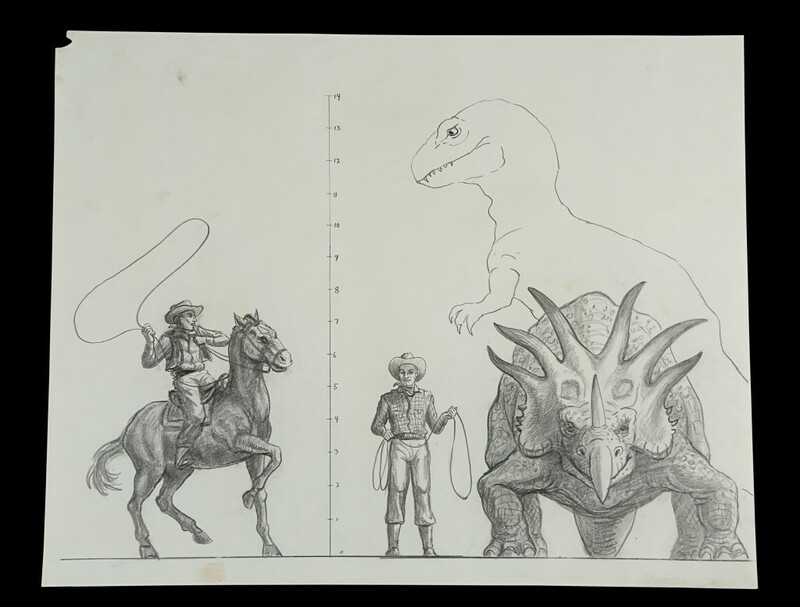 Harryhausen often made detailed size comparisons as a matter of routine; they were vital for his own reference, as well as that of the actors, to help them visualise the true size of his creations. This drawing is very detailed and represents the final version of this image, executed in pencil on paper. 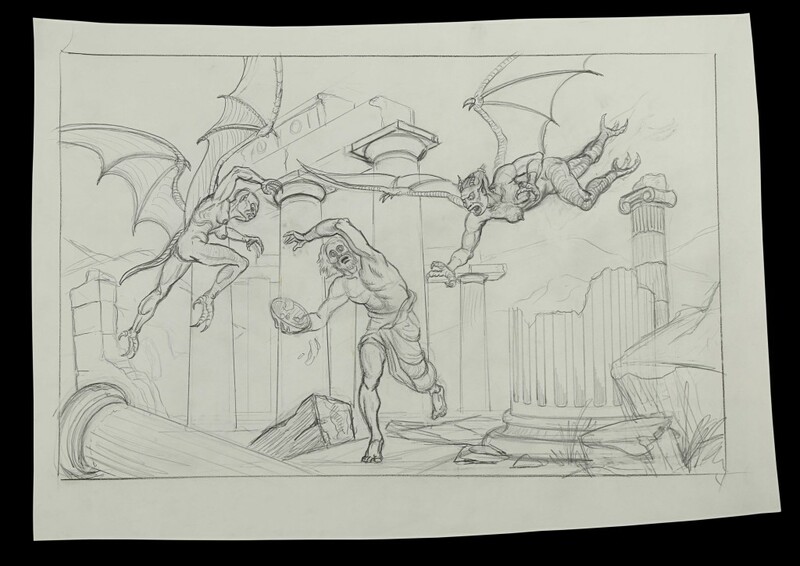 The second sketch is another Harryhausen hand-drawn concept sketch showing Phineas (Patrick Troughton) and the Harpies from the Don Chaffey fantasy-adventure film Jason And The Argonauts. It shows Phineas, the old, blind man, fleeing a ruined temple while being attacked from the sky by the mythical winged creatures, again, executed in pencil on paper. 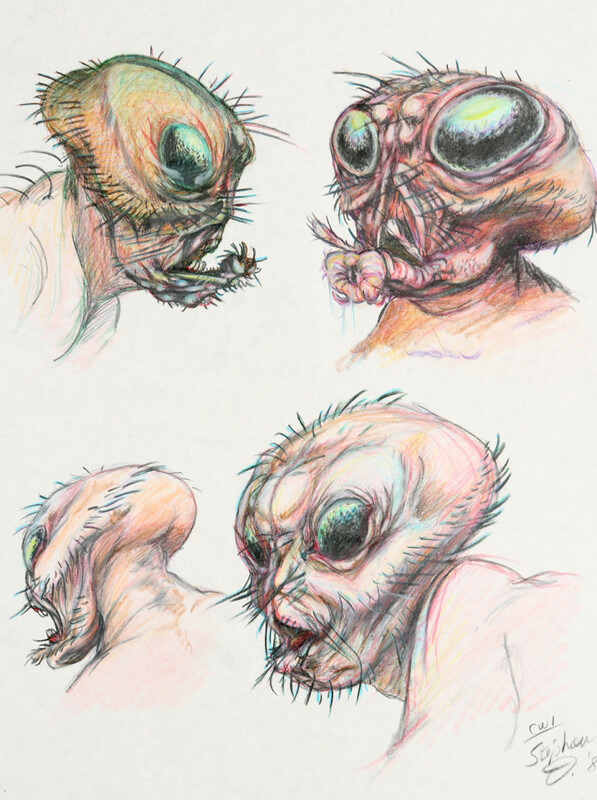 Next up in our look at some of our favourite art pieces in this year’s Live Auction is a pair of hand-drawn Fly concept artworks from David Cronenberg’s sci-fi horror The Fly. 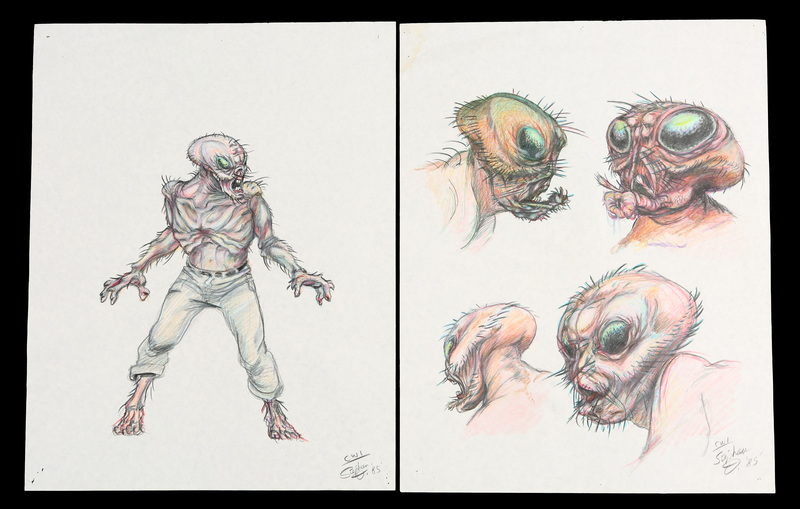 Drawn by Creature Effects Artist Stephan Dupuis, the first page shows a full-body illustration of Seth Brundle (Jeff Goldblum) as The Fly, with the second page featuring four versions of The Fly’s head at various angles. Both are drawn using colour pencil on art paper, and include the artist’s signature at the bottom-right corner. This lot would be perfect for any fan looking to add a really visual and unique piece of movie history to their collection! 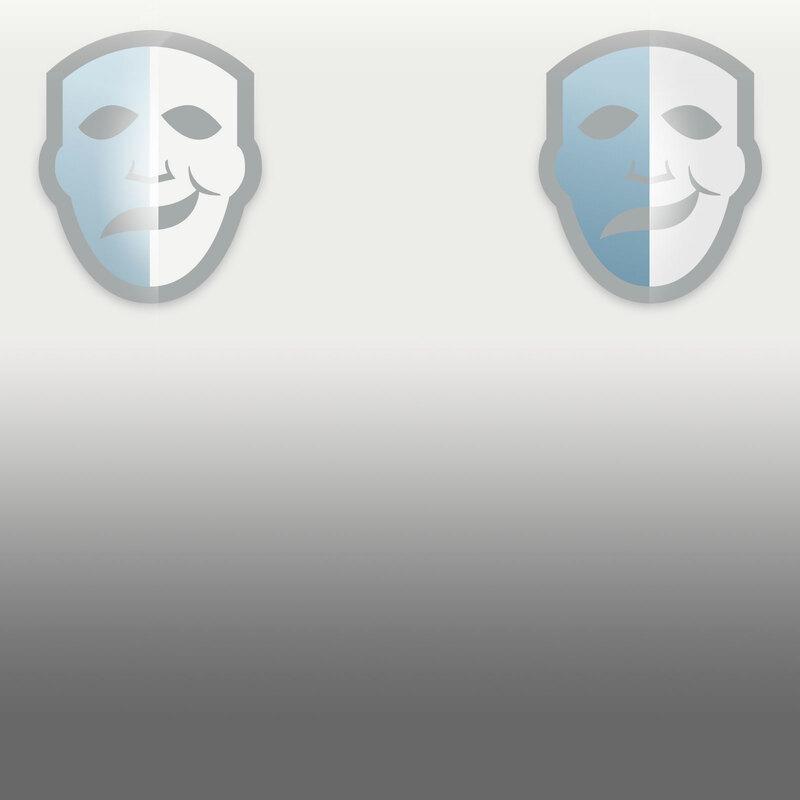 This lot is definitely icon-ic! This hand-drawn concept sketch of the interior of the Golden Idol temple from Steven Spielberg’s adventure film Raiders of the Lost Ark. 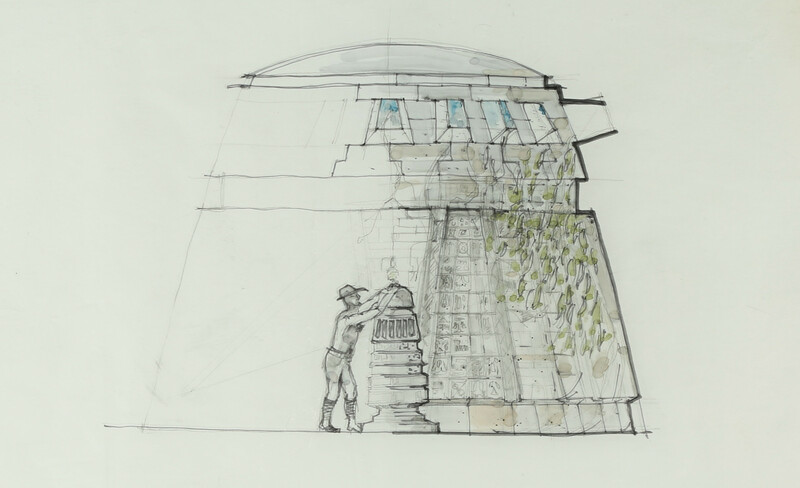 Illustrated by production designer Norman Reynolds, the artwork is executed in pencil, inks and watercolours on tracing paper and depicts that iconic scene of Indy on the temple altar, reaching for the idol. A beautiful addition to any collection! Another great set of lots for Conan fans are these hand-drawn sword designs from John Milius’ fantasy epic Conan the Barbarian (1982). 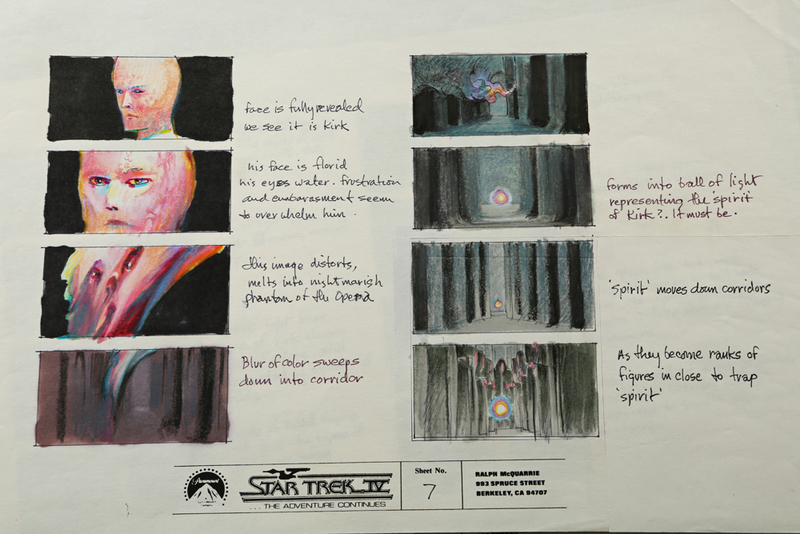 These pieces, illustrated by production designer Ron Cobb (also known for his design work in Star Wars (1977), Alien (1979) and Leviathan (1989)), depicts the prodcution concepts of the two most memorable swords used by the main cast in the film. 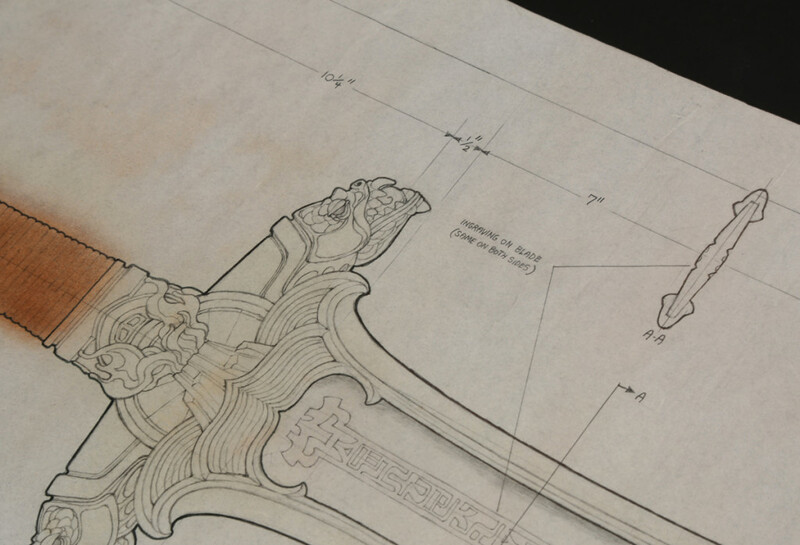 The first piece is a hand-drawn concept design of the Atlantean Sword, which was discovered by Conan (Arnold Schwarzenegger) in an ancient tomb and became the signature weapon of the Cimmerian warrior, during the film. This amazing full-scale illustration of the Atlantean Sword is rendered in pencils and inks, with brown inks applied to give colour to the grip and bronze guard, and also shows the engraved text along the blade, as well as the ornate detailing of the guard and pommel. The second design is of the Father’s Sword, which was crafted by Conan’s father (William Smith) before being taken by Thulsa Doom (James Earl Jones) after his raid on the Cimmerian village. 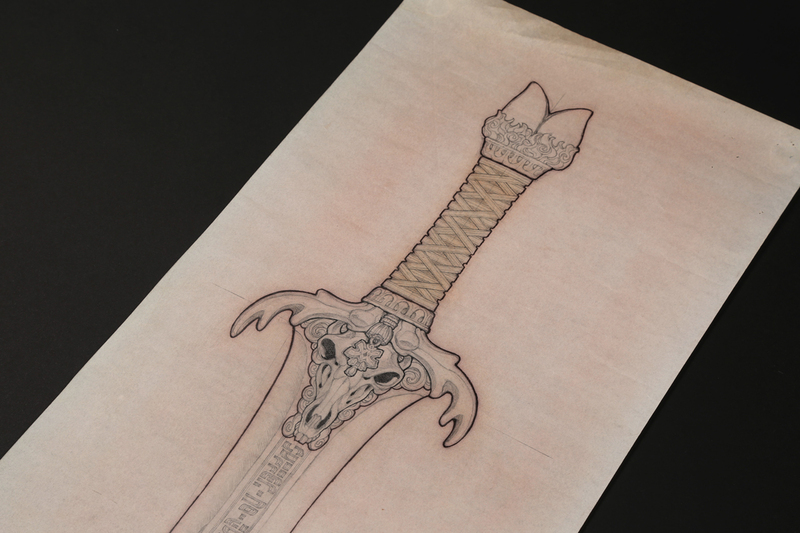 Again illustrated by production designer Ron Cobb on white paper, this full-scale rendering of the Master’s Sword is has been intricately illustrated, from the horned pommel to the skull guard and the engraving along the blade, featuring the text “Suffer No Guilt Yee Who Wield This In The Name of Crom”. The artwork is signed by Cobb and dated 1979 along the sword’s blade. 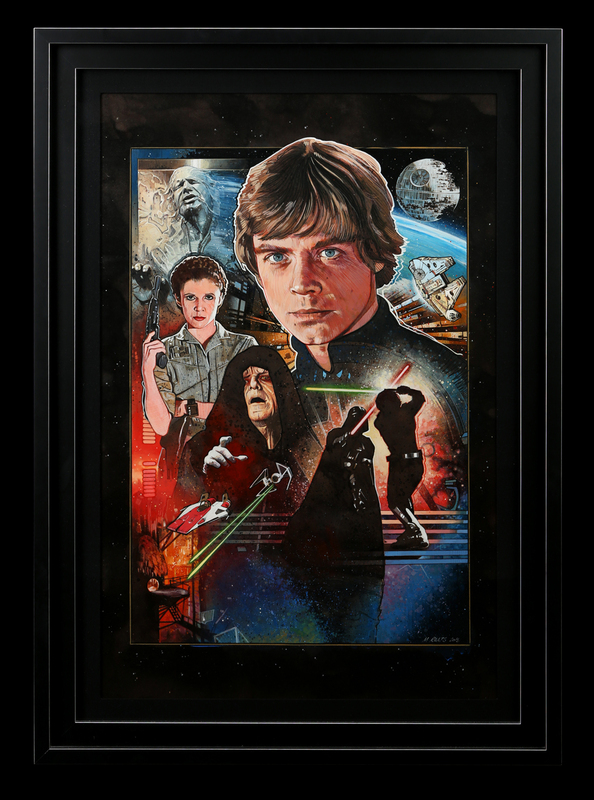 This iconic hand-painted poster artwork was made for the 30th anniversary celebration of Richard Marquand’s Star Wars: Return of the Jedi. The artwork was created by poster artist Mark Raats, and is rendered in gouache and Prismacolor pencils on MDF board and sealed with Artist’s varnish. The painting was completed in 2013 and used as the official poster at a 30th anniversary cast-and-crew screening of the film held at Pixar Animation Studios in Emeryville, California, and is presented in a custom-built wooden display frame with UV-filtering Perspex. 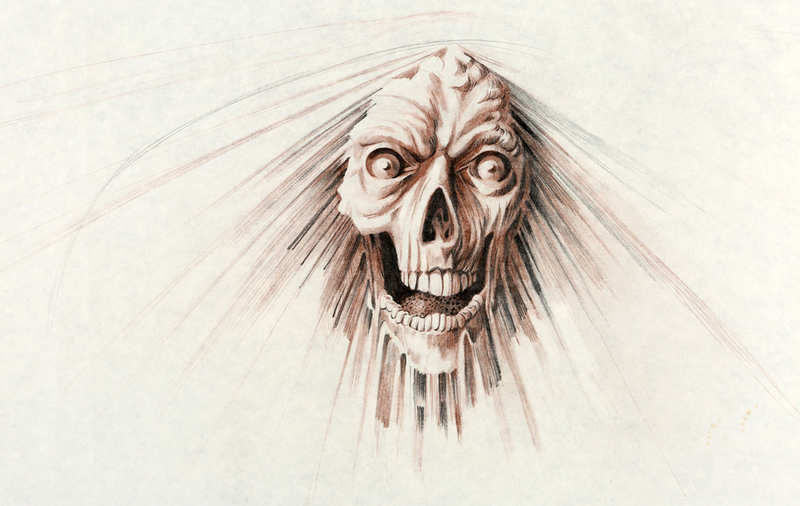 Another really interesting lot coming up in the 2017 Live Auction is this hand-drawn Ark Angel of Death concept art from Steven Spielberg’s adventure film Raiders of the Lost Ark. German soldiers opened the Ark of the Covenant during the film’s climax, and encountered ghostly angels, which dispatched them. This lot includes 12 drawings on 28 cm x 36 cm (11” x 14”) paper, and two drawings on 46 cm x 61 cm (18” x 24”) paper. 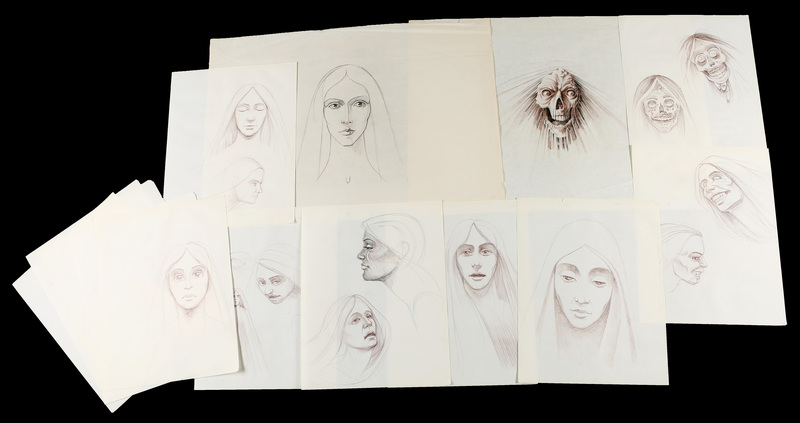 Drawn in coloured pencil, they showcase various designs for the Angel of Death, both as a beautiful woman and as a terrifying skeletal figure. 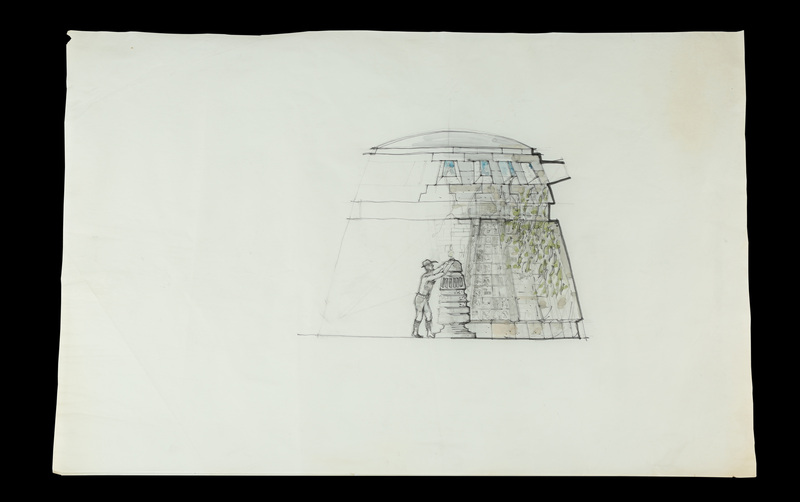 Another great lot for Star Wars fans is this amazing hand-drawn storyboard from George Lucas’ Star Wars: A New Hope. This early production storyboard was illustrated by Joe Johnston, who would go on to win an Oscar® for his work on Raiders of the Lost Ark. Executed in inks on tracing paper, this storyboard depicts Luke Skywalker in the cockpit of his X-wing as he flew above the surface of the Death Star. Hand-written notes are present at the top and bottom, detailing the action in the scene, with additional annotations detailing the frames the storyboard was to be used for. 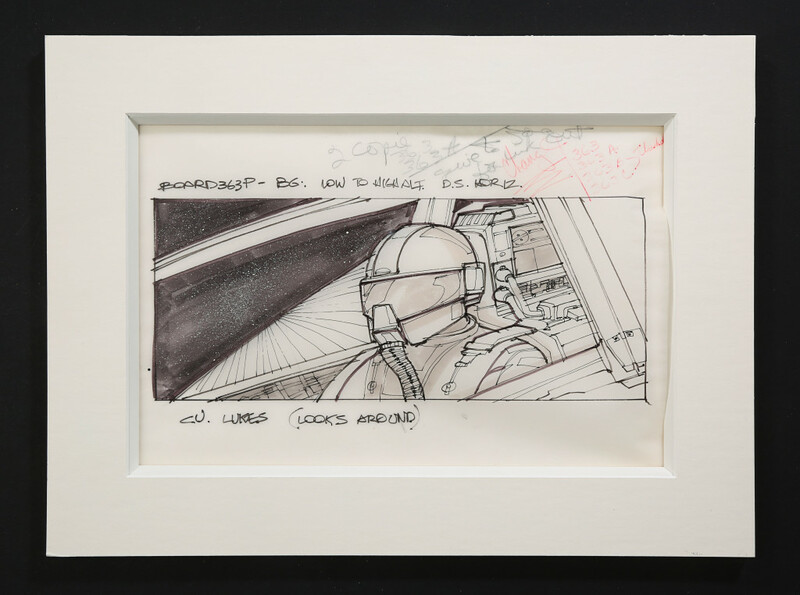 This beautiful hand-drawn storyboard and others like it depicting iconic Star Wars scenes by Joe Johnston will be up for grabs in the Live Auction, so make sure you keep an eye out for them! 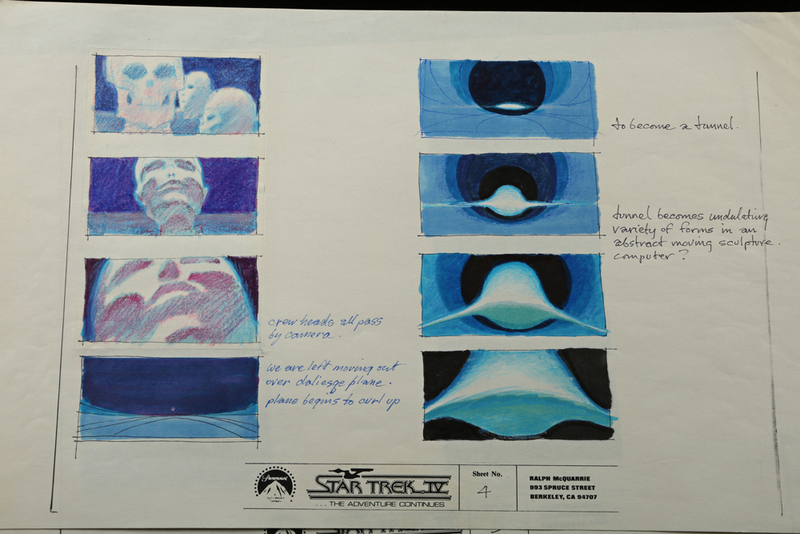 And last, but not least, is a set of hand-drawn production storyboards for Leonard Nimoy’s sci-fi sequel Star Trek IV: The Voyage Home, by Ralph McQuarrie. Better known for his conceptual work on Star Wars, he was a world-renowned visionary conceptual designer and you can see his work and influence in many well-known films that he worked on, such as Indiana Jones: Raiders Of The Lost Ark (1981), E. T. the Extra-Terretrial (1982) and Star Trek IV: The Voyage Home (1986). This art lot depicts the Klingon Bird of Prey during the time-travel sequence toward the beginning of the film. 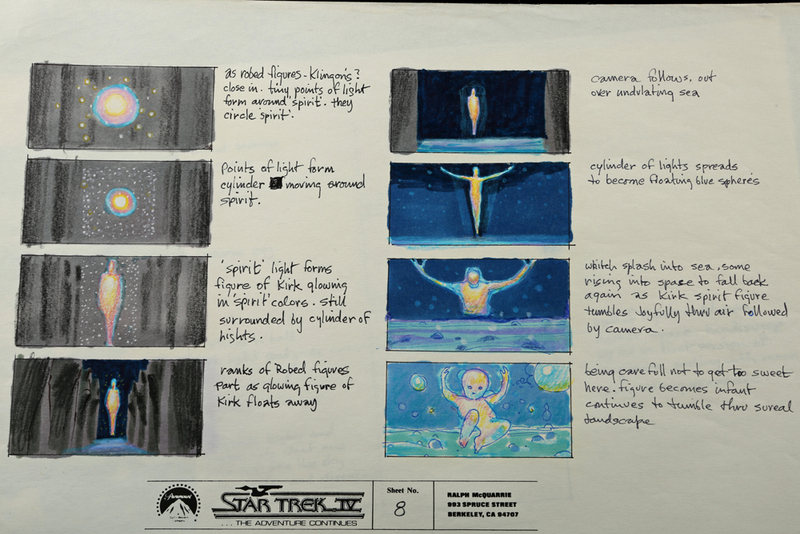 The art was drawn by the film’s visual consultant and renowned film artist Ralph McQuarrie, and also includes storyboard notes and descriptions with many of the frames. 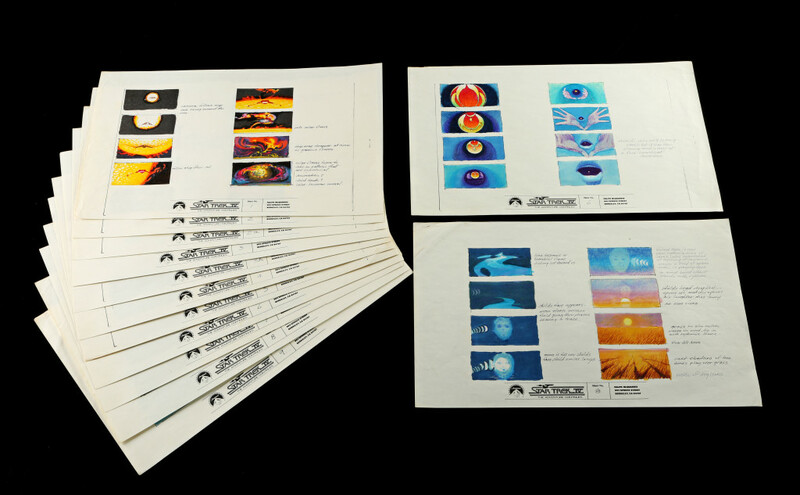 The sequence is made up of 15 pages and includes 73 frames in total. The storyboard frames are sketched in ink and pencil, with pages varying from three to eight frames per page. This lot is a must have for any McQuarrie fans!